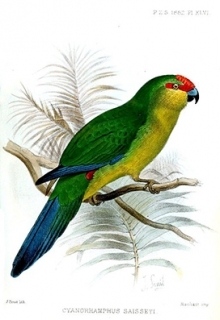 The New Caledonian Parakeet, Cyanoramphus saisseti, is threatened by mining and predation by invasive species. Project progress: In 2002 WPT funded the start of a long-term study to map the distribution and abundance of the New Caledonian Parakeet. Outcomes: Studies and surveys continue, along with the installation of cameras at nest sites to monitor breeding. Radio-tracking of individuals is currently being utitilized to determine breeding success and survival (Theuerkauf and Rouys 2005). A study is currently underway to estimate the species' range and population size (Legault et al. in prep.). Where found: New Caledonia, Melanesia. History: The New Caledonian Parakeet is found in New Caledonia, Melanesia, where it can be seen in fragmented forests across Grand Terre (Barré and Dutson 2000, Ekstrom et al. 2000, Dutson 2011). It is also seen from the Colnett massif in the north to the Goro region in the south. It is most common in the south, where mining threatens to affect populations, and scarce in the north. Ecology: The New Caledonian Parakeet is found in indigenous montane forests, where it feeds on fruits and seeds of casuarinas and pawpaws, Carica papaya, and other plants. This species has a scattered range, mostly in rain forest and forest edges. There are also reports that it tolerates Niaouli savanna, Maquis scrub and humid forest to 1,500m. It is most abundant in Gymnostoma preforests and in wet forests from 400-800m. Birds are quiet and difficult to observe in canopy; will forage for seeds on the ground.